A Turkish mounted artillery trooper's sabre brought home by an officer of the British 5th Dragoon Guards from Balaclava after the famous Charge of the Heavy Brigade. 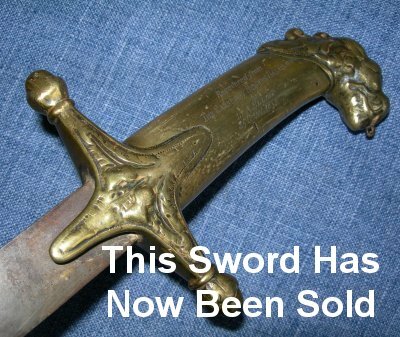 This sabre was brought home to England by Lieutenant Alexander James Hardy Elliot of the British 5th Dragoon Guards after he returned from the Crimean War. He most likely recovered it from a fallen Russian cavalryman from the infamous Causeway Heights at Balaclava after the British Heavy Brigade successfully defeated a larger Russian cavalry force. 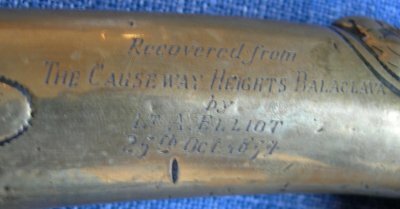 It is period engraved to the hilt's grip "Recovered from The Causeway Heights Balaclava by Lt. A. Elliot 25th October 1854"
It most likely came from a Russian cavalryman because it says "recovered", which shows Lt. Elliot knew it was Turkish and meant he either collected it from where a Turk dropped it, or from a Russian who had taken it as a battle trophy. As the Turkish were defeated by the Russians further up the heights from where the British Heavy Brigade charged the Russian cavalry, and as the gun positions on the Heights remained lost to Russian forces for some months after, it is most likely it was taken from a Russian by Lt. Elliot. Lt. Alex J Elliot was aide-de-camp to General Scarlett the Commander of the British Heavy Brigade and was wounded in the battle. As a result of his heroism and ability on the day, Lt. Elliot was promoted to Captain (without purchase, which means he earned the promotion rather than bought it) on the 22nd December 1854. This is a rare piece of history with exceptional provenance. The 27 inch blade has some marks to it, including shot marks, but is firm in the brass hilt. It is a bargain and sound investment as so little is available with such provenance and connection. Further / full sized images available upon request. Item reference number 510 (104).